Students at Blair Middle and High School in Pasadena take part in National School Walkout on March 14, 2018. 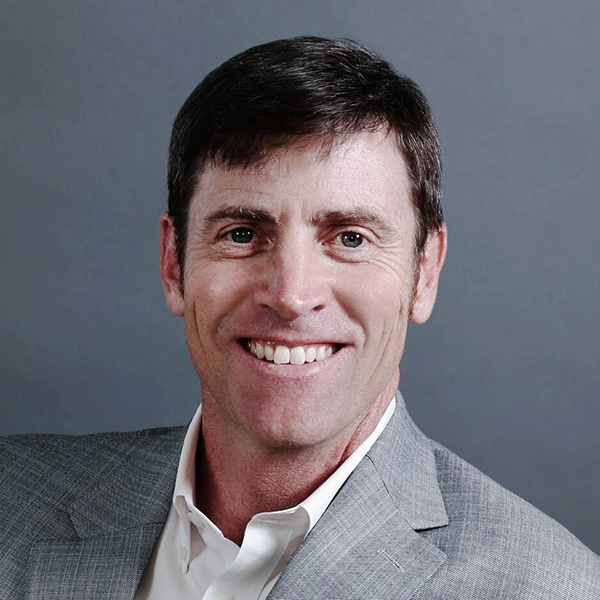 This story was updated at 4 p.m. on March 14, 2018. Wednesday, one month after the massacre at Marjory Stoneman Douglas High School in Parkland, Fla., thousands of students across California and the U.S. walked out of school as part of an unprecedented effort to force Congress to change the nation’s gun laws. Beginning at 10 a.m., students from elementary schools to colleges left their classrooms for 17 minutes — one minute for each of the people killed on Feb. 14, when Nikolas Cruz walked into the school and opened fire with an AR-15-style assault rifle. It was the nation’s 259th school shooting in the past quarter century. The protests — part of the National School Walkout organized by EMPOWER, the Women’s March youth group — took on a variety of forms. On some campuses students wore all black, while in others they wore orange in reference to Florida. Some were highly organized and included speeches and raucous chants. In others, students simply stood in silence. Many protests were held on campuses, but a number of them also spilled into the streets. Students in Seattle staged sit-ins along roadways. At a school on Chicago’s South Side, hundreds of students streamed out of classrooms and into the surrounding neighborhood. A group of protesters in Manhattan’s Upper West Side marched on the Trump International Hotel and Towers. 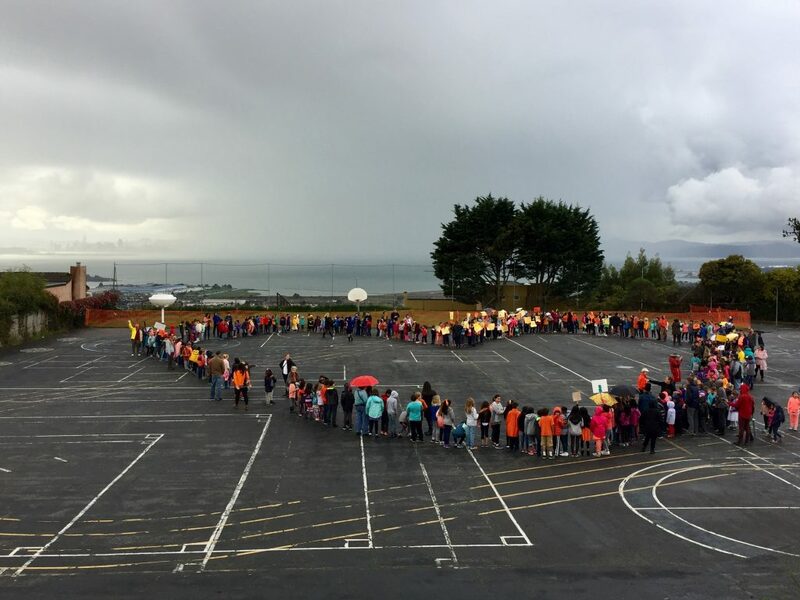 Students at Madera Elementary School in El Cerrito, Calif., form a giant heart on March 14, 2018. 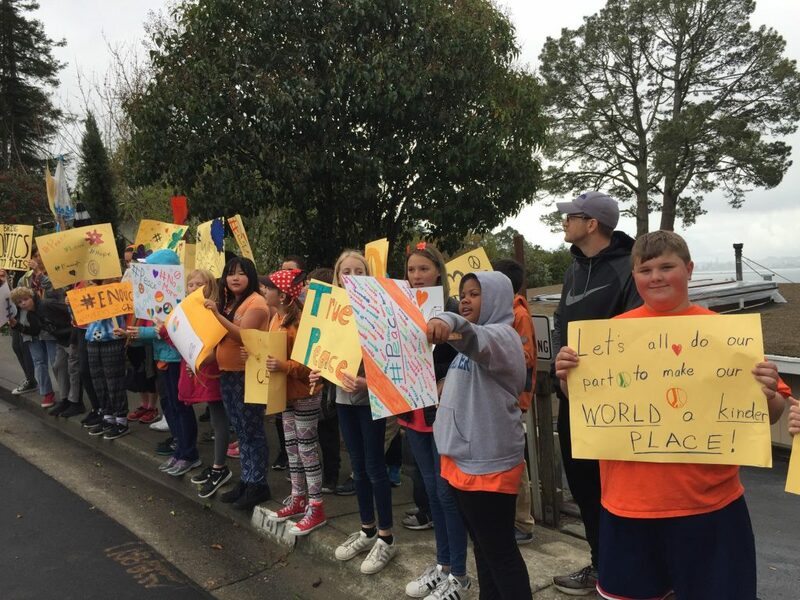 Students at Madera Elementary School in El Cerrito, Calif. protesting gun violence. 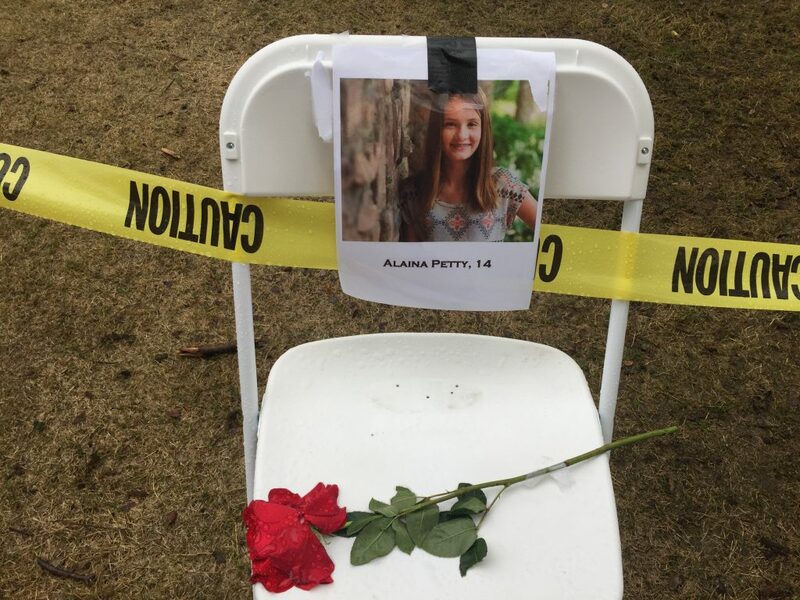 Students at Patrick Henry High School in San Diego honored the victims of the school massacre in Parkland, Fla., by arranging chairs in a circle and attaching a photo of a victim to each chair. In Washington D.C., thousands of students from the suburbs gathered outside the White House and on Capitol Hill, where lawmakers, overwhelmingly Democratic, came out to greet them. 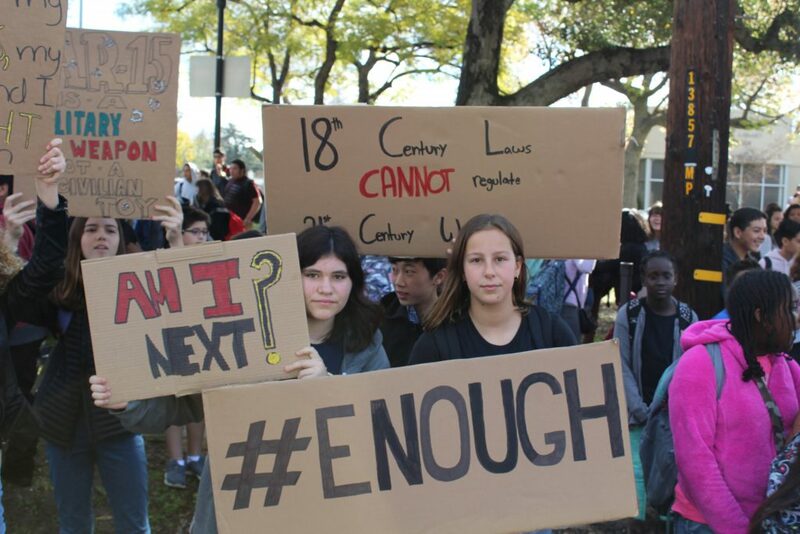 In California, chanting “Not One More” and carrying cardboard signs demanding gun control, about 600 students piled out of Blair Middle and High School in Pasadena for a noisy but peaceful rally along an adjacent public street. More than half of the student body at the 1,050-student campus joined the demonstration and returned without incident to classes. “Our mission is to continue the message that the lives of our kids are worth way more than guns,” said Allie Bodaken, an eighth-grader who was one of the rally organizers. She carried a hand-drawn placard asking: “Am I Next?” as the crowd marched along Marengo Avenue just east of the Pasadena Freeway. At Berkeley High School, students rallied for more than an hour — at times in driving rain — holding signs reading “How many more of us need to die?” Demonstrators also formed a giant peace symbol on the school’s football field. 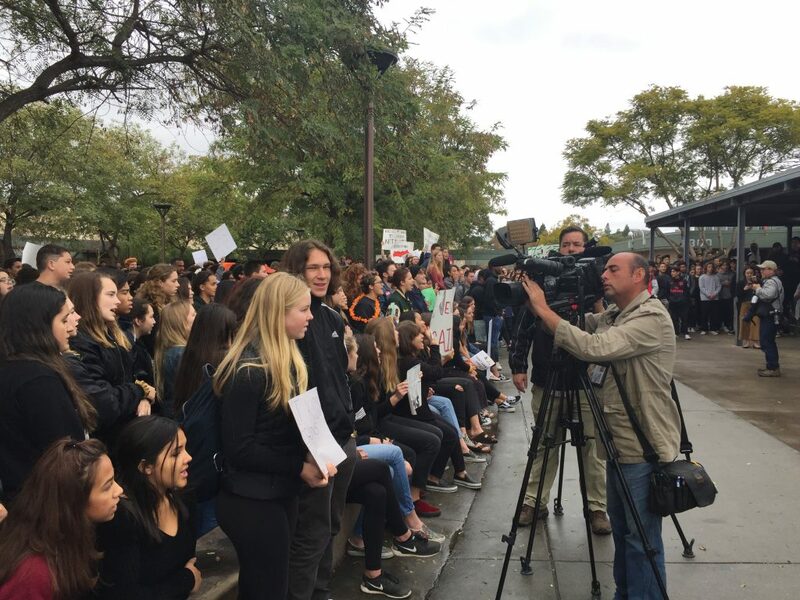 In Los Angeles, students gathered on the front lawn of Alexander Hamilton High School and held up signs and cell phones, encouraging passing motorists to honk their horns. “It’s not right that the NRA has canned lessons for preschoolers on how to stay safe in the case of an active shooter,” bellowed Miriam Schweiger, a senior at Hamilton, as she addressed the crowd. Some students stood before their peers reading brief biographies of the victims of the Parkland shooting, intoning “never again” after describing each victim’s life. Hundreds of students at Patrick Henry High School in suburban San Diego stayed on campus and participated in a planned a program that included a moment of silence for the Parkland victims, speeches by student organizers and a song by the school choir. A number of students claimed to be inspired by the Parkland survivors who’ve captivated the country with their sustained and strident anti-gun messages targeting Congress and the gun lobby. They said this moment is about young people finding their voice. Joshua Berman, a senior at L.A.’s Hamilton High, said Parkland has changed the previous dynamic in which mass shooting events would prompt a rush of anger that would inevitably die down after a few days. Members of the media take photos and video of the crowd that gathered at Patrick Henry High School in San Diego to participate in the National School Walkout on March 14, 2018. 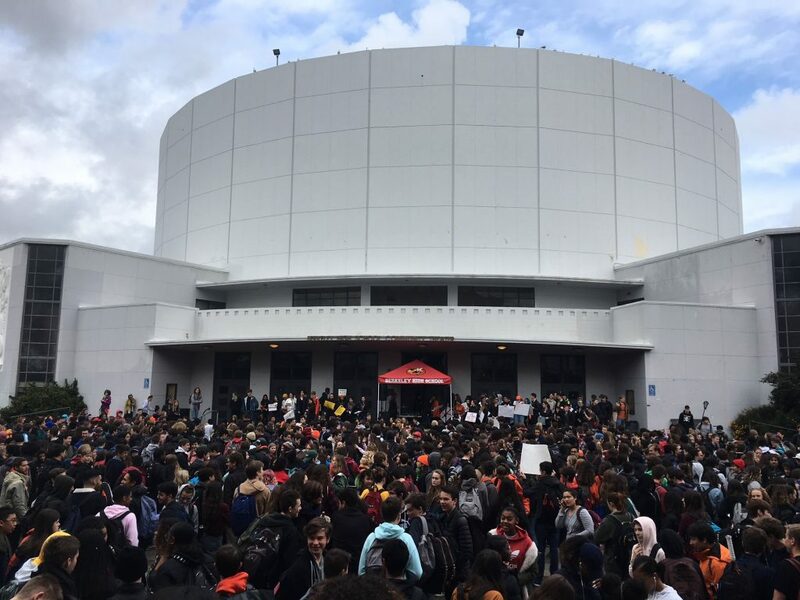 Hundreds of students walked out of classes to rally in the courtyard of Berkeley High. Nickelodeon and MTV, two youth-focused television networks, went off the air for 17 minutes Wednesday in support of the protests. “The next 17 minutes are dedicated to young people who are leading the fight against gun violence,” read a message on MTV that was followed by photos of those who died in the Parkland shooting. Student leaders at Oakland Technical High School demanded that elected officials ban assault weapons and increase the age for gun ownership to 21. They promised to vote out legislators who turn a blind eye to gun control when they turn 18. “I loved seeing all of my classmates immediately streaming to the voter registration booths,” said Kendall Prime, an 18-year-old senior, who marveled at the large turnout that numbered in the hundreds. Sandy Villa, a senior at Patrick Henry High, saw Wednesday as an opportunity to let her voice be heard on issues beyond gun violence. Guns were also not the primary focus at an elementary school protest in the east Bay Area. Instead, students made posters, chanted, marched and formed a giant heart to promote peace and kindness. Under drizzly skies, students as young as kindergarten toted signs and chanted “We want peace!” as they marched around the block. Motorists honked their support and parents snapped pictures. Many students and teachers wore orange to show unity with protesters at other schools, who were also wearing orange. In Redding, a generally more conservative part of the state, students at Shasta High School walked to the school’s main quad and student leaders read the names of the 17 Parkland victims. At Red Bluff High School, not far from a school shooting in November that left six dead, administrators said they would not interfere with students who wished to walk out. Students were directed to the gymnasium for a moment of silence and were provided information about school safety. After Wednesday’s protests, some urged their fellow students to take things to another level. Caroline Pers, a 15-year-old freshman said this is just the beginning. “We’ve got to keep the momentum going,” she said. Kolidakis and Pers will get their wish on March 24th, when a march on Washington D.C., called “March for Our Lives” along with sister marches in large California cities. And another nationwide school walkout is planned for April 19, as a remembrance of the 1999 Columbine High shooting in Littleton, Colo..
– EdSource staff reporters Larry Gordon, Theresa Harrington, Ashley Hopkinson, Carolyn Jones, Mikhail Zinshteyn, and Nicholas Savage contributed to this story. I believe that the section regarding Thornton Jr High does not hold the whole story.From what I’ve seen on social media apps, chaos was withheld everywhere. Although a student DID hold a sign saying young lives matter, havoc broke out as children piled through the streets, buying food, and disregarding the point of the whole protest. I would say apples and oranges, Ellen, but wouldn’t a consistently pro-life position applaud these young people for promoting civilian disarmament and valuing life AFTER birth?